April 2015 WONDERLAND RECEIVES NOMINATION FOR BEST JAZZ WITH VOCALS ALBUM IN THE INDEPENDENT MUSIC AWARDS! IMA PRESS RELEASE: Lissy Walker, the folk-jazz vocalist of Berkeley, California was named by Music Resource Group as a Nominee of The 14th Independent Music Awards, for her album, Wonderland, in The Best Jazz With Vocals category. The eclectic mix of established and rising talent nominated in the 14th IMAs were culled from thousand of submissions that were released during the program's eligibility period, between June, 2013 thru December 2014. The IMAs celebrates the meritocracy of talent and democratization of creativity; winners and nominees are determined solely by artistic merit. The winners will be determined by a panel of influential artist and industry judges including Suzanne Vega, Jane Monheit, Shelby Lynne, and Judy Collins. Read the full PRESS RELEASE here, and cast your vote! 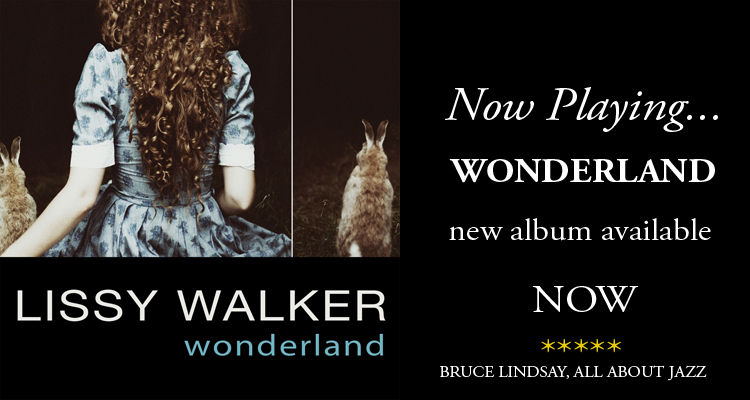 November 2014 WONDERLAND-FEATURED ALBUM OF THE WEEK ON NPR/WNYC! Tune in and stream Thanksgiving week to The Jonathan Channel, where great American songs live, on National Public Radio/WNYC to hear selections from Wonderland, the Featured Album of the Week, every hour on the hour. Hear Lissy interviewed by Michael Shobe, the show's producer on The Headliner. Other Radio News: "Lover Man" was played on Jazz After Hours, hosted by Jeff Hanley on Public Radio International. You can also find it on Jazzradio.com on The Contemporary Vocals Station and on jazz stations across the country. Bruce Lindsay at allaboutjazz gives it ✭✭✭✭ and Girl Singers calls it "...a hand-crafted work of art, a fine addition to any collection of jazz vocalists...very highly recommended." 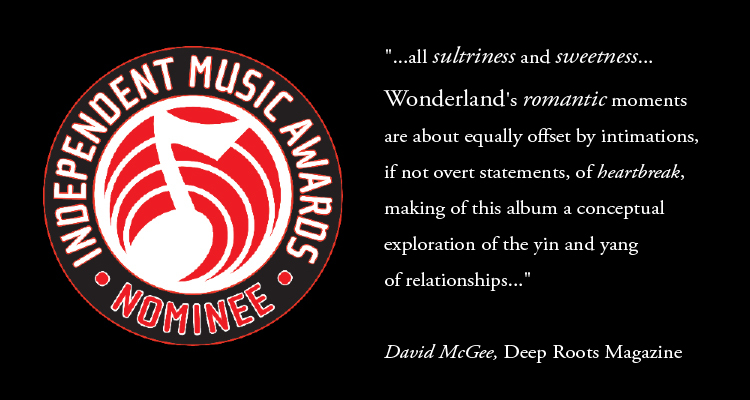 David McGee at Deep Roots Magazine says "...all sultriness and sweetness...super romantic...Wonderland's romantic moments are about equally offset by intimations, if not overt statements, of heartbreak, making of this album a conceptual exploration of the yin and yang of relationships." Dreamy and bittersweet, heartfelt and swinging, Walker delivers fifteen songs on her highly anticipated second album, WONDERLAND. Rooted in jazz, with elements drawn from the worlds of folk, country, and 70's acoustic pop, Walker and her virtuosic band slip effortlessly between genres to create their own soulfully sweet sound on another beautiful compilation of gems from the American Songbook and beyond. 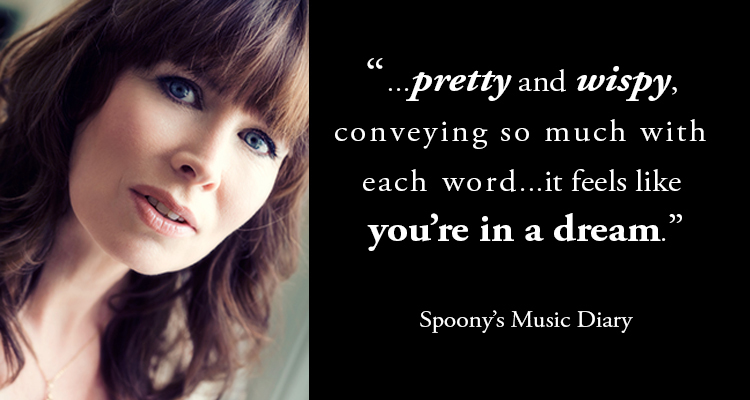 Look for it on CDBaby, iTunes, and Amazon, with radio adds September 23. January 2014 IT'S A WRAP! Lissy is thrilled to have Carla Kihlstedt on violin I and II and Liz Schultze on cello on Wonderland. Jon Evans has composed gorgeous string arrangements for three tracks, which will be recorded at his Brick Hill Studio in Cape Cod in September. January 1, 2013 HAPPY NEW YEAR from WONDERLAND! We are in the thick of it now! Mixing has begun. Release set for 2014. Stay tuned! Steven Bernstein on trumpet, Ben Goldberg on clarinet, Jon Evans on lap steel and Dave Macnab on 12 string guitar have recorded overdubs on Wonderland. The project will break for the Summer, and resume in the Fall. January 24, 2012 LISSY'S NEXT ALBUM WILL BE RECORDED at FANTASY STUDIOS on VALENTINE'S DAY! She will be joined once again by John R. Burr on piano, Scott Nygaard on guitar and mandolin, Philip Worman on cello, and Jon Evans on bass. Jason Lewis joins the band on drums. 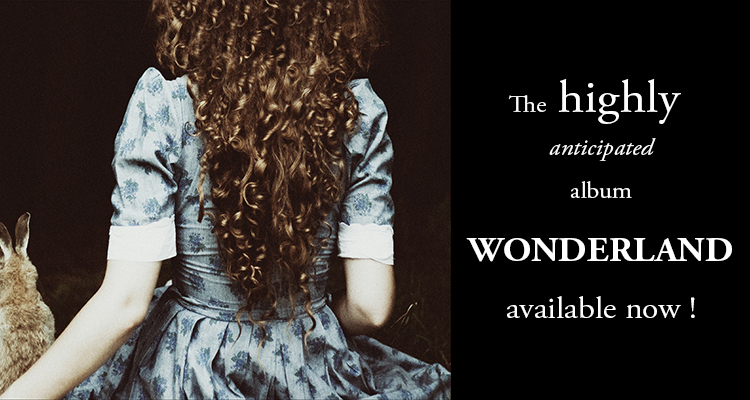 Wonderland is an entirely fan-funded project. "I'm so grateful to everyone who contributed to help make this next project happen. And I'm thrilled to be recording at the legendary Fantasy Studios. Wonderland at Fantasy on Valentine's Day, how perfect is that?" Lissy will be joined on stage with John R Burr on piano, Scott Nygaard on guitar, Sam Bevan on bass, and Philip Worman on cello. They will be performing selections from her acclaimed debut album, Life Is Sweet, as well as previewing new re-imagined songs from her upcoming album, Wonderland. Organic Wine Uncorked will be pouring organic wines on this special evening. The cabaret world's only magazine, CABARET SCENES, reviews Life Is Sweet, and calls it a "sweet treat!" August 30, 2011 LIFE IS SWEET "HITS A HIGH NOTE!" Lissy will perform with Faith Winthrop, Darryl Rowe, and Barry Warren at The Parish Hall on January 12, 2011. 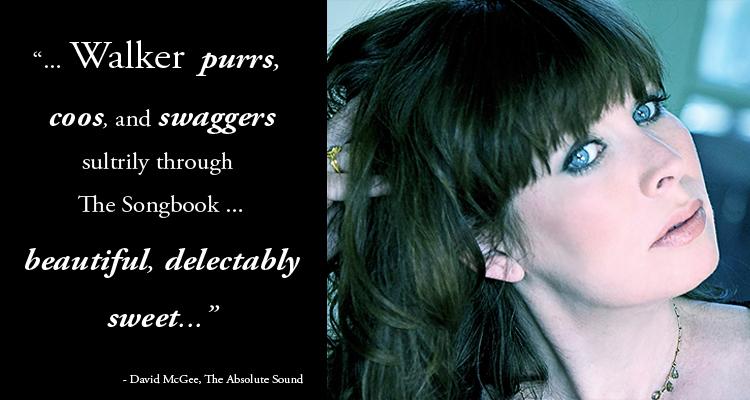 October 1, 2010 "A SHEER DELIGHT FROM START TO FINISH"
Read the latest wonderful review of Life Is Sweet by David McGee in the October, 2010 issue of The Absolute Sound. September 21, 2010 CELLULOID HEROES CHARTS on FINLAND'S TOP 10 JAZZ SONGS! As part of his special radio show featuring California Jazz Artists, both well-known and up-and-coming, Carl Stewart features Lissy, Charles Mingus, and others on Jazz Caravan - KRTU San Antonio. The show will be available to stream until August 7. Seven tracks from the album have been added to this wonderful jazz station. Jazzradio.com presents 24 different jazz radio channels. You'll hear it on the Contemporary Vocals Channel, where today's jazz singers reinvent and create new standards. June 29, 2010 MORE GOOD NEWS! Lissy will be appearing at Caffe Trieste, 1667 Market Street in San Francisco on July 10 at 8:00 with pianist Willie Russert and Philip Worman on cello. June 29, 2010 GOOD NEWS! Life Is Sweet is one of CDBaby's top Folk-Jazz albums! Lissy will be performing on June 18, 2010 at The Epworth Music Ministry at 7:00. The performance will benefit Bread And Roses. She will be joined on stage with The Albany All-Stars. May 13, 2010 MORE RAVE REVIEWS! Life Is Sweet continues to stay on the Jazzweek Charts for nine weeks. Jonathan Schwartz plays I Remember You on his Saturday Show, May 8 and says it is "unlike anything he's ever heard." 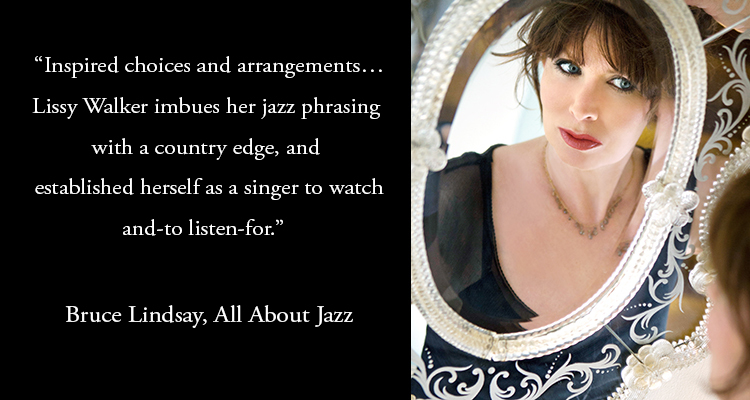 Brian Lindsay writes an excellent review for AllAboutJazz. Life Is Sweet at #5 in WBGU's Top Ten this week. Life Is Sweet continues to stay on the JazzWeek Charts since its debut in February. Radio play includes over 50 stations throughout the nation, including WWOZ New Orleans, KSDS San Diego, and WAER New York. Life Is Sweet was featured on Jonathan Schwartz's infamous Saturday Show on April 17, 2010, where he announced that he "had discovered a new voice". Lissy was featured and interviewed on Bob Collin's Jazz Cafe on WHRU New York on May 5. The album was on two top 20 lists, WBGU Ohio and WICR Indianapolis: and was featured on Jazz and Bossa Radio, where they played the entire album. The news was then picked up and featured on two music blogs, JAZZofilo and Jazz and Bossa Radio and Review where she was the featured artist of the week. Music critics continue to write about the record, including a glowing review from Wilbert Sostre in JazzTimes and Scott Yanow, LAJazzScene. Lissy will be joined by her band: John R. Burr, Scott Nygaard, Jon Evans, Dave Ellis, Dave Rokeach, Erik Jekabson and Philip Worman. Lissy Walker will release Life Is Sweet on the Strawberry Canyon Records label in early 2010. Co-produced with Jon Evans, the album brings new life to a set of standards by Irving Berlin, Randy Newman, Johnny Mercer, Ray Davies, Harry Nilsson, and Nick Drake. Walker's band includes celebrated SF and NYC players John R. Burr, Scott Nygaard, Jon Evans, and Steven Bernstein.